Across the world, an increasing number of governments are embracing digital and biometric technology to transform how services are distributed and needs are assessed. Governments require the basic ability to track citizens, residents, and visitors, and digital identification systems have transformed how modern borders function. In emerging markets, the adoption rate has been particularly rapid. In India, a massive digital and biometric identification program called Aadhar is streamlining how services are disseminated, taxes collected, and votes cast in the world’s largest democracy. The promise of these digital systems is a combination of increased efficiency and reduced corruption through tighter control of resources. The promises of digital and biometric identification systems also provide opportunity to transform the work of aid agencies working with refugee and migrant communities. With the right systems in place, aid distribution can be streamlined, and made more transparent and effective. But such a profound transformation requires the co-operation of many actors, the right digital architecture, and investment in vast databases. There are several hurdles standing in the way of this utopian future, but that shouldn’t stop its development. Given the historic waves of migration over the last decade due to war, climate change, and economic plight, the ability to identify migrants and refugees is a pressing global challenge. In the private and public sector, could digital and biometric solutions enhance aid distribution and strengthen transparency and efficiency? And more importantly, can such solutions deliver aid faster to those in need? Approaches to digital and biometric identification vary significantly by region. Whereas India successfully catalogues its population through its Aadhaar program, African governments have overlapping and competing private biometric databases. Globally, biometric technology is evolving rapidly. Fingerprint scanners are already widespread, whether for border checks in Cambodia or bank account verification in Nigeria. Iris scans are increasingly common, too, and the next generation will employ science fiction-like techniques such as heartbeat authentication. More than 1bn people live without proof of identification, with the overwhelming majority coming from the world’s poorest regions. Such a state leaves large swaths of people – especially women and minorities – trapped in a cycle of poverty, without the ability to grow assets, unable to receive services such as healthcare and education, and blocked from the global supply chain. Without proof of identification, should a person become a refugee, they may be completely unable to access goods and services thanks to the digital systems we use to disperse them. Displaced persons without IDs also have greater difficulty crossing borders when fleeing their homes. Initiatives such as BanQu utilize blockchain technology to enshrine permanent records for stateless citizens, but efforts are not yet widespread. Humanitarian organizations have traditionally supported vulnerable populations such as refugees and migrants. This support is generally manifest in aid distribution, particularly in refugee camps. Digital technology is transforming the way humanitarian organizations approach their mammoth tasks. The UN High Commissioner for Refugees (UNHCR) created the largest and oldest database still used today, ProGres, in response to the 1990s Kosovo crisis. At first it only stored names and photos, but by 2015 biometric pilot programs were present in Jordan and Kenya. More recently, in March 2018, the Ugandan government began using a biometric system to verify South Sudanese refugees. Let’s start by listing the challenges. Biometric systems are expensive and funding is short. Expected speeds are high but roll out is slow. Trusted technologies such as internet access lag in poor and conflict-exposed countries, while host countries often leverage refugees for political gain. Moreover, experimenting with new systems diverts money away from actually assisting refugees. Then there is the issue of global oversight. International standards dictate how to provide assistance with food, water, and shelter, but not biometrics. With only limited programs operational today, the international community lacks a unified vision for the future. Nevertheless, the world faces the greatest number of refugees ever recorded and must find new ways to become more efficient and transparent if we wish to create sustainable solutions. Digital identification may yet have a key role to play in the humanitarian sector. The Syria crisis is a perfect example of the challenges at play. There is no clear number of Syrians refugees and internally displaced people. The number has been listed as anywhere between 1.5m and 3m, depending on which source you reference. Digital biometric identification systems could help refine the numbers, but the question is who controls the databases. 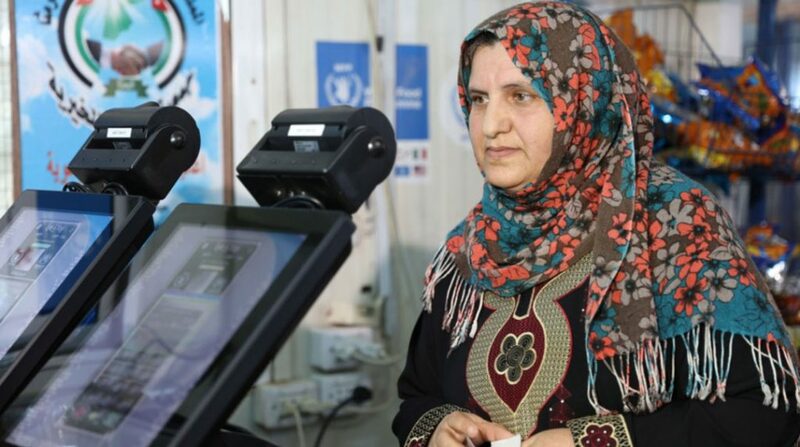 In neighbouring Jordan, at least 650,000 refugees have been registered with iris scanners as of February 2018. Private companies helping the UNHCR, such as IrisGuard, hope their nascent ledgers will be supported after the crises are over, and will accelerate both financial inclusion and economic development in the region. But the technology and company track records remain unproven. Furthermore, the advent of mobile and biometric aid distribution is intertwined with an increase in cash transfers; each is hastening adoption of the other. This is in part because digital wallets cut out corrupt middlemen as well as prevent duplicate payments. These are solid goals; however, opportunities for misuse increase when good intentions are not coupled with strong online security. Last year, IFRC released a 176-page handbook on data protection, with guidelines ranging from drones and cloud services to mobile apps. However, for all these precautions, a 2017 Harvard study concluded that “humanitarians today lack sufficient ethical guidance” for the digital age. As much as humanitarian organisations are trying to stay ahead, the pace at which technology, change and the wider international community is fast outweighing the ability of humanitarian organizations to stay ahead. The rules are still evolving. Meanwhile, African countries are now home to the world’s largest migrant populations. A program in Uganda to register South Sudanese refugees is struggling to stay ahead of the population flows. Unreliable internet has resulted in massive backlogs at reception centers. In its first two months, the program registered 19% of the 1.4m Sudanese refugees, equating to an average daily rate of 3,451 registrations with a peak of only 7,901 – a far cry from the 18,000 daily target. Compounding registration delays, the program faces funding shortages, poor physical infrastructure, and corruption scandals. Refugee figures are highly politicized, with host countries often using them to push a political agenda. The Ugandan government is seeking additional international aid, and has been accused of inflating refugee figures by one-third. But sometimes it’s the technology itself that falls short. A 2013 working paper by the Center for Global Development details how failure-to-enroll rates of fingerprint scanners range from 2% in Malawi to 10% of women in Chad. Even for correctly registered populations, data security continues to be a conundrum. The cumulative financial and emotional toll of digital identity programs ultimately exacerbates aid diversion – at least for now. Perhaps the most telling reality here is that these same underutilized digital identity technologies are tailor made for solving the world’s most pressing development issues. In some countries, up to 50% of citizens lack formal documentation. Digital registries could offer millions of new consumers financial grants, insurance, medical treatment, school records, and more. Security concerns that dampen investment could be alleviated by relying on safer cashless solutions. Likewise, biometrics can overcome a common hurdle with uneducated populations: digital literacy. For starters, increase efficiency and transparency at the governmental and organizational level. Technology exists that can revolutionize humanitarian work, but most organisations and governments cannot properly use it due to insufficient funding, training, and clear ethical guidelines. Efficient public-private partnerships could ease this burden. Beyond this, the problem of interoperability of biometric databases has to be addressed. Without interoperable systems and databases, digital identification is all but useless for aid recipients. Given the pace of technological innovation, the development community is facing existential questions as to how it should implement technology for the good of the communities it serves. Digital and biometric identification technology is a perfect example of this tension. While the technology can dramatically improve the lives of refugees and migrants, it requires a drastic shift in strategic thinking – not to mention more resources – for many players including governments and the international community. In simple terms, the development community has the technological capacity to solve many problems facing aid distribution such as identification, but lacks the political and financial will to implement solutions on its own. Moreover, honest discussion is needed about how new technology can be misused to the detriment of those it was intended to help. The implementation of new digital solutions thus requires further study before its promises can be fully realized. Working as PR/Development ( Malaysian Red Crescent Society – Penang State); we over here has been fortunate enough to have a new government that is more transparent to new challenges. In a multi-racial, diversified ethnicity, and mixed religious-thinking of our population, such work may be quite demanding at times. I hope to receive valuable suggestions on how to improve performance in an environment like Malaysia. Thank you for a very interesting report. Sounds like a huge opportunity. Is there a community of practice driving a lot of this thinking or is it quite organic and separated? Feels like a collective drive might result in quicker progress in the areas most needed?